Wood, the original heat source. For centuries, long before the convenience of modern appliances, we heated our homes, and cooked our food by burning wood. Wood stoves and fireplaces have evolved over this time, to be incredibly efficient and clean burning, and are still a great way to heat your home with almost no pollution. With these simple technologies, you get an extremely clean wood burning stove, more heat and longer lasting fires on a load of wood, and with systems that keep the glass doors clean, you can enjoy the mesmerizing ambiance of the rolling flames. Today’s wood stoves come in many styles, from a basic functional wood stove, to enameled cast iron units that enhance the decor of your home. Prefabricated wood stove chimneys mean wood stoves can be installed just about anywhere in your home with no need for complicated masonry work. If you have an existing masonry chimney, Wood stoves can be installed with chimney liner. Modern EPA Certified Wood stoves provide a great combination of beauty and function for any home without the pollution older wood burning appliances create. When looking to buy a wood stove, a visit to one of our fireplace & wood stove showrooms in Ottawa or Carleton place can be a great place to start! We have a wide variety of wood stoves on display, and operational, so you can try them before you buy. Our experts will help you choose the stove that best fits the form, function and budget you are looking for. Easy monthly payments are available, and with online pre-approval, you can shop with confidence. Installation of wood stoves in Ottawa Carleton and surrounding area does require a building permit and inspection from the municipality, but no need to worry. When you buy a wood stove from Top Hat, our experts will provide all that is needed, and ensure that the process is easy and seamless from start to finish. When the installation of your new wood stove is complete, we provide a WETT certificate, which certifies that all aspects of the installation of the wood stove meets all codes and regulations. Just sit back and enjoy the warmth and ambiance of your new wood burning stove! Call for a free in-home consultation, or visit one of our Fireplace showrooms, in Ottawa or Carleton Place today! The 4300 Step Top wood stove; Quadra-Fire tradition of excellence. The Eco-Choice WS18 medium-size wood-burning stove delivers warmth and comfort to your home, while being easy to operate and maintain. With elegant, historic styling that adds to the decor of any room. 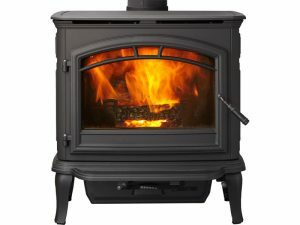 A practical wood stove with Pacific Energy’s clean-burning technology. NEOSTONE 2.5 Wood Stove installed in our Ottawa Showroom. Maximum heating capacity, with Extended Burn Technology for the longest burn time.